Is anyone else as happy as I am for Spring to be officially here? Although in the Toronto area it's still quite wintry, I'm enjoying the plus 5 weather. Grass is being exposed, the snow is melting, the days are brighter, longer, and I'm enjoying it all. When I think of Spring, I think of hope, newness, and life. The sun is coming out more, and we're finally going to be able to pack away those parkas. There's some things I'm looking forward to, and I'm sure you are to. The first thing I'm looking forward to is wearing all my Spring clothes. Layers, a lighter palette, and saying goodbye to boots are all beautiful things. Also, some nice pastel nail colours will be coming out! This doesn't pertain to everyone, but the Spring represents university coming to an end. I'm excited to be finishing my fourth and final year. Saying goodbye to the thousand of essays means I can do more of the things I enjoy (before entering the real world). Dog walks. I know Bingley and I are itching for warmer and sunnier weather so we can walk more. Bingley is fairly small and doesn't do well with extreme cold or heat, so the Spring is his favourite season. (Plus, his birthday will be coming up soon!) More time outside means all-around happier people. Flowers, green grass, trees blooming, and all of the spring (and summer) produce that will be coming out. I can't wait to start my condo herb garden again. I've missed you Spring, this Canadian winter was way too long. Follow me on instagram @melodyannep, bloglovin, and twitter @melodyyannep! To start, preheat your oven to 350 degrees. Add the cookie dough, nutella, cocoa powder, and cinnamon into a bowl and mix very well. From here, you could easily make little balls and pop them in the oven for double chocolate chip cookies. For the peppermint hot chocolate cookies, you'll need to roll them out into little balls first. Once you've done this, squish the balls into flat rounds, and add 2 mini marshmallows or 1/2 of a large marshmallow to each cookie round. Enclose the marshmallows inside the dough and make a round ball. Add your crushed candy canes to the top, and pop them in the oven for about 10 minutes. These cookies can really impress people because they're stuffed. They're really delicious once out of the oven because the marshmallow is very gooey. Enjoy these cookies with a warm drink or send them as a yummy gift to someone. They're easy, quick, and impressive! Check out tomorrow at 7 pm for a new recipe! I absolutely love chickpeas. They're high in protein and fibre, and absolutely delicious. I'm always trying to find news way to enjoy them so I thought I'd venture out into the falafel world. I made these falafels for lunch today and they're easy, very quick, and very yummy! You'll also have everything on hand which means less money for you to spend. Put your pan on the heat at medium and add in your oil. Add all of your ingredients into your food processor. Put the lid on and whiz it up! (Its that easy really!) Make your little falafels with about a spoon or so of your mixture. If you wet your hands lightly it makes it the mixture stick less to your hands and easier to work with. Place your falafels into the hot pan, and let each side brown and crisp up. This should take about 1-2 minutes per side. Enjoy them with a salad, pitas, tortillas, yogurt, or any other chutney that you like! You could easily put them in the oven to bake as well. Next time I'm going to try adding sweet potato into the mix, and use them as a veggie burger! Bon appetit! As you may know, I had three (now two) exams this week. Today was rainy and cold and plain ugly in Toronto so I definitely needed a pickmeup. I always get picked up on a bad day by my cute pup, Bing. When I walked through my door he was so happy to see me; his tail was wagging, he was dancing, and he threw himself on the floor to get scratched. There were also many kisses. I love him, and am so grateful to have him. I hope I make him as happy as he makes me. Before I got home, I witnessed another dog and owner bonding that was just adorable. A man was taking his huge dog for a walk. They sat down at a bench, and the owner took out a new coat for the dog. He put the coat on him, and the dog jumped him with a hug and kisses! It was so beautiful. Ps. Follow me on instagram @melodyannep for more pictures of bingley, updates on the blog, and lots of food! Also give me a follow on Bloglovin here! Hello everyone! Hope you're all having a lovely day! I am officially on Bloglovin, and I would love if you could follow me at https://www.bloglovin.com/blog/12987339 Also, I am on instagram! Please give me a follow @melodyannep I share photos from my blog, of the pretty things around me, and of course of my little dog, Bingley! Autumn is definitely my favourite season and all around time of year! The crispness of the air, the colours of the leaves, thanksgiving, and my birthday all add up to a lovely time for me. This is just a general post for the seasonal things that I've prepared so far. I used a rainy saturday morning to pickle some veggies. I pickled radishes, cabbage, carrots, and red onions. For a general pickle, you use 2 cups of vinegar, 1 cup of water, 1 tablespoon of sugar and 1 tablespoon of salt. I added coriander seeds as well. You can boil the water before you make the mixture for food safety. I made my own pumpkin spice latte from scratch, and I have to admit it was pretty delicious! Make coffee or espresso. In a pot combine 3 tablespoons of pumpkin purée (just the canned stuff) with about 3/4 cup of milk, brown sugar, and a pinch of pumpkin pie spice. Let it heat up and add it to a mug with your coffee! I topped it with more pumpkin pie spice to make it the ultimate latte! I have multiple pretty pumpkins around my condo now, and they just add such a wonderful sparkle and piece of autumn. This best shows my autumn mornings: Bingley, sleeping on my bed, being cute and cuddly. I'm so lucky to have this little guy! May 9th is Mr. Bingley's birthday, and of course, we throw him a puppy party! He turned the big 3 years old. We had party hats and crowns, toys for him, and I made vanilla cupcakes with sprinkles on them (for the humans)! The point is, Bingley is family to me and I want to make him feel special. Dogs provide humans with so much joy and happiness so when we can share it with them, please do. Celebrate your pup's birthday, and try to get them in a party hat! (I feel so accomplished that I got Bing in one!) 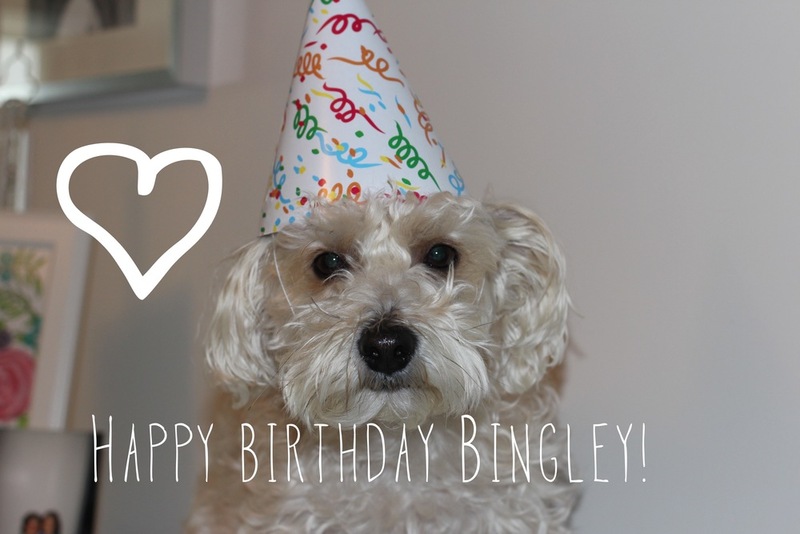 Happy birthday Bingley! Mother's Day is right around the corner (this Sunday! ), and if you haven't figured out what to get your wonderful mom, look no further. When you're on a tight budget, and don't want to show it, doing/giving things that are truly personal to your mom will help to conceal that. If your mom is a foodie, take her out for brunch or lunch, give her a cookbook from one of her favourite chefs, or make her a wonderful meal at home. If your mom has a green thumb, buy her a beautiful plant, pots, or something to accent her garden. If she is just someone you love dearly, buy her something pretty like a blouse, scarf, or purse, or something enjoyable like a book, art, or flowers. Whatever you get your mom make sure it comes from the heart, even if it doesn't have a huge price tag. Oh and always include a card! Cards are where you can write a tiny message that can spark specialness in your mom. Enjoy the time with your mom on Mother's Day. Remember two things: 1. Everyday can be Mother's Day 2. Celebrate Mother's Day with all the mothers in your life, and make everyone feel special because they deserve it! This is my official welcome to my Etsy shop, melodyanneprints! My shop contains photographs that I have shot over many seasons and throughout different cities. I am a photographer, and a camera collector (kind of a camera hoarder haha). The works in my shop have been shot with either my Canon Rebel T3i, Canon Rebel T5i, or my Diana Mini. Needless to say, I'm into both digital and film photography. Photography is a way for me to capture my happiness and passions. I have been in art shows, competitions, and have had some photographs published in magazines, which all adds up to ways for me to extend my happiness through photography to others. And that's the idea behind my shop folks. Since spring has finally sprung, new photographs will be popping up like May flowers on my shop! In honour of that, and the start of my blog, I'm giving you the chance to use the offer code MSINBETWEENERS to save 25% off your entire purchase until May 31st! I ship throughout Canada, and to the United States, as well as countries in the European Union. You can check out my shop at www.etsy.com/ca/shop/melodyanneprints. If you have an Etsy account, please follow me! (and follow my Instagram @melodyannep too!) Feel free to comment or contact me through either this post or my Etsy shop; I'm all eyes and ears! ps. Bingley is such a fantastic model! Hello everyone! Today's post is about my loveable and full of personality puppy. Well he isn't technically a "puppy" (he's going to turn 3 soon - stay tuned for a birthday party post) but he's still a puppy to me! He's a Yorkie Bichon mix, and captures the hearts of everyone around him. So please let me introduce my oh so smart, handsome, and charismatic Mr. Bingley. Yup, he's named after Jane Austen's Pride and Prejudice (I'm a English major haha) character Charles Bingley. Ohh I forgot to mention he can dance too! "Not a girl and not yet a woman." - Britney Spears This is an iconic line from Ms. Spears. Although I can't help at laugh at them, somehow though, it does apply to us twenty-somethings. We are the "inbetweeners". We're at the time in our lives where we want independence but need it at an affordable price. We are the women who want to live a happy healthy life on a budget! My goal for this blog is to highlight the important parts of life for the ms. inbetweener. I'll focus on things like how to eat fantastic meals on a budget, how to become your own budget-savvy interior decorator, and how to go out and not spend a fortune! Most importantly, my blog is a local one that'll focus on Vaughan, and from time to time, Toronto.